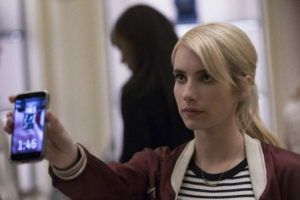 The new teen-pic, Nerve (directed by Henry Joost and Ariel Schulman) concerns Vee (Emma Roberts), a lower middle-class high school senior from Staten Island whose wild friend introduces her to an underground internet fad. In the game, “Nerve” anonymous watchers dare players like Vee to perform increasingly dangerous stunts, the goal being to amass the largest number of followers. Nerve is an effective indictment of internet culture, critiquing the abusiveness of anonymity, allegorizing the bad behavior engaged by many when they do not have to confront the consequences of their bullying and incivility. The film extends our more pedestrian internet encounters (such as being forced to read nasty user comments) toward the domain of the action film: the last challenge for Vee and her competitor to win the game is to duel each other with guns. But Nerve also extends in a different, surprising direction, toward modernist literature. In one of Vee’s earliest dares, she has to kiss a stranger in a restaurant. As she scans the dubious possibilities, she spots Ian (Dave Franco) because he is seemingly absorbed in Vee’s favorite novel, Virginia Woolf’s To the Lighthouse (1927). Ian explains that he has only just begun reading. He asks Vee if the characters ever get to the lighthouse. She explains that they do, but that this is not really the point of the novel. The conversation is quickly left behind, as Vee and Ian team up to tackle more dares in the game. Indeed, Ian is not interested in Virginia Woolf at all: also a player of “Nerve,” Ian uses the game’s ability to extract everyone’s personal information off of their social media accounts. Ian knows he can attract Vee’s attention in the restaurant by reading To the Lighthouse because her online profile tells him that it is her favorite novel. And yet, from the standpoint of cultural studies, the discarded Virginia Woolf novel continues to resonate throughout the rest of the film. When Vee and Ian finally arrive at the final confrontation, in an abandoned commercial lot that resembles some sort of Roman coliseum, they have effectively reached their lighthouse. In the case of Nerve, the light is not centrally generated to guide ships, but diffused across hundreds of cell phones of anonymous watchers, whom the film exposes as complicit in the crime of thrilling to the suffering of others. To the Lighthouse is an experimental novel about the Ramsay family on vacation at their summer home at the beach. The novel begins with Mr. Ramsay informing his son James about how bad weather will keep them from visiting the lighthouse, an event to which he has been desperately looking forward. His mother is furious with her husband for tormenting the child. Lily Briscoe, a friend of the Ramsays, attempts to paint a portrait of Mrs. Ramsay and James. One of the other guests, Charles Tansley, proves the novel’s villain, declaring with righteous sexism that women should neither paint nor write. In an experimental second act, ten years, and the entire First World War, passes. Mrs. Ramsay dies, as do two of her children. In the last act, the remaining Ramsays return to the summer home. As Mr. Ramsay and James finally sail out to the lighthouse, Lily completes her painting, relying not upon her current sense perceptions, but on the memories she has of ten years before. What is the relationship between Virginia Woolf’s modernist novel and the contemporary action film, Nerve? The closest critical term we have is post-modernism, a sense that popular culture has swallowed up the techniques of Woolf’s modernism, stripping it of its political edge and cheapening it in the commercial space. However, I would coin a different formulation, cis-modernism, adapted from chemistry, where the atoms are on the same side of a double bond in a molecule. Nerve continues, in a different register, the project Woolf began: how does a creative woman register her stable identity in a communication space in which everything is fragmented and incoherent? Vee is Nerve’s Lily: she begins the film afraid to tell her mother that she is going to accept her scholarship to CalArts, to become an artist, and not stay behind to continue her unfulfilled life on Staten Island. Vee transcends the piecemeal definitions of herself mined by the game off of her Instagram accounts. For Nerve, the lighthouse is a Platonic one: Vee uses the game to solidify her identity, pursuing her creative spark, against a dangerously fragmented world of social media, of incoherent individual lights. Such a project is not some horrid commercial abuse of Virginia Woolf’s To the Lighthouse; it is a beautiful 2016 cinematic extension of it.